Enhance your professional or scientific research with the Bodelin ProScope HR QC Inspector Kit. Optimized especially for Quality Control (QC) inspections, this kit includes all the necessary components for the task, including a handheld digital camera, two lenses, and an adjustable stand that will help you reach your professional or research goals. The central component of this kit is a compact and ergonomic imaging device, featuring an Aptina color CMOS sensor with 1.3MP resolution and 1/4" format. With the two included interchangeable lens modules (0-10x and 50x), it gives you options for a variety of samples that require a low level of magnification. An LED illumination ring is integrated into each lens, helping the imaging sensor deliver clear, high-contrast images and videos at frame rates up to 30 fps. To provide versatility and options that best suit your lab setup, the hand unit can be used as a handheld device, mounted on the included adjustable stand, or be coupled to other microscopes and borescopes, by means of included or optional mounts and adapters. The construction of this compact scope does not lack in ergonomics and utility. The polymer handle offers a contoured shape for a comfortable grip, conveniently located control buttons near your thumb and index finger, and a forward-looking camera directed at a 90° angle relative to the handle. If your application requires long exposure, complete stillness of a camera, or hands-free operation, you can use the included adjustable stand to hold the imager in any required position. For additional mounting options, there are two 1/4"-20 tripod sockets on the handle that will provide a secure and stable connection to most standard tripods. 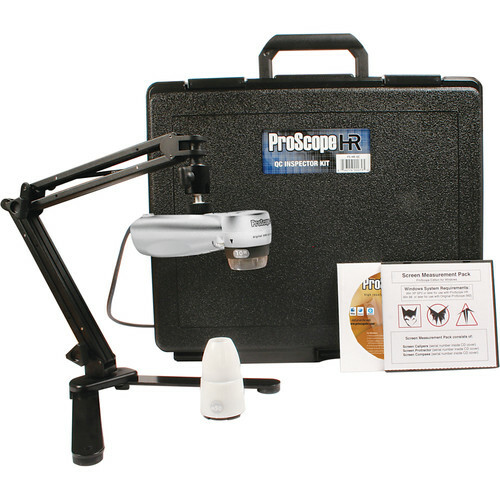 Using the included ProScope software, your microscope can be connected to your Windows or Mac computer. Box Dimensions (LxWxH) 15.5 x 14.12 x 13.25"